Pesto absolutely has to be one of my favourite things of all time. I could happily eat nothing but pasta with pesto for the rest of my life I love it so much, it’s quite astonishing that it’s actually taken me until now to have a go at making my own, especially considering how simple it is. I have put approximate measurements on my ingredients here as it really is one of those things you have to taste as you go along and adjust accordingly. For example, I started off with about half the amount of cheese, and only one garlic clove and just kept adding according to what i thought it needed more of to balance the flavours. The great thing about pesto is it has so many different uses. It can be used as a really simple pasta sauce, spread on toasted bread for bruschetta, added to a tomato sauce or tomato soup to enhance the flavour, mixed with mayonnaise for a salad dressing…. the possibilities are endless. I made this batch for a bruschetta platter I was making for a starter, but I’ve still got plenty in the fridge so I’ll be using it throughout the week on pasta, on toast etc. If you’re into giving people homemade foodie gifts this would make a great addition to a little food parcel stored in a nice little Kilner jar with some ribbon, you could even make your own little labels! 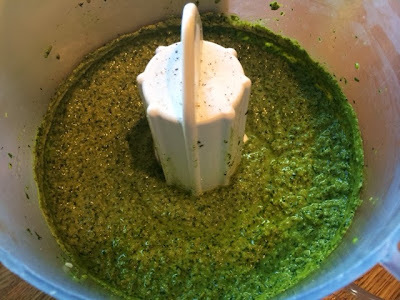 Pesto is also an incredibly adaptable recipe. Basil is quite traditional, but you could swap it for other herbs. 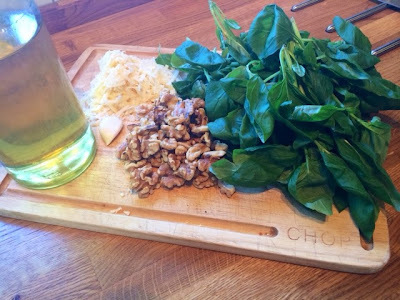 A classic pesto would also use pine nuts where I’ve used walnuts here. Grana padano cheese is very similar to parmesan and available in most supermarkets alongside it, so use whichever you prefer. 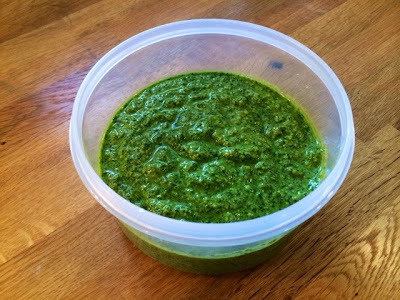 Now I’ve mastered green basil pesto, next I’m going to have a go at making red pesto with some roasted red peppers. 1. 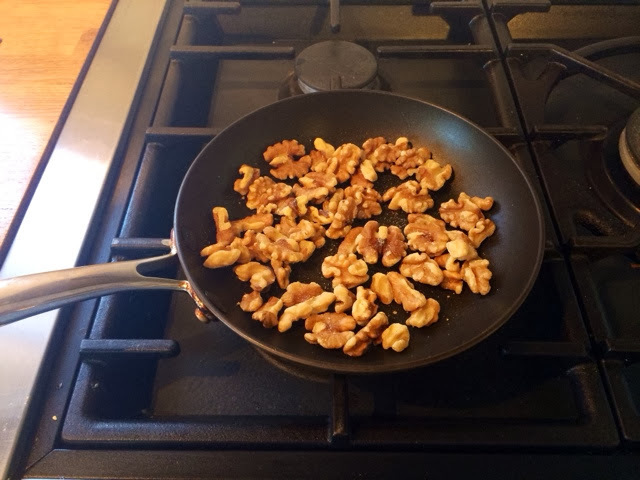 Firstly, in a dry pan lightly toast your walnuts. 2. In a food processor whizz up all of the ingredients together pouring in the olive oil as you go. Taste as you go along and adjust the ingredients accordingly, adding more salt and pepper, more oil or more cheese and garlic as you see fit. 3. Transfer to a tupperware or a jar to be stored in the fridge. 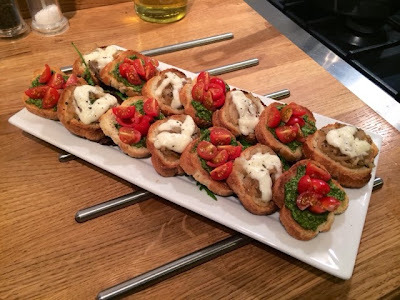 Here I’ve used the pesto to spread on toasted slices of french bread and topped with quartered cherry tomatoes as a tasty starter/buffet platter. It also makes a great sauce for fresh homemade pasta for a really simple supper.